The Authors Answer: What Made Your Best School Visits Great? Once in a while, I’ll throw out a question to my author pals on Facebook, and I’m always amazed by their generous responses. Recently, I asked, “Authors and illustrators: What have schools done to knock your socks off when you visit? From the simple to the sublime, I’m interested to share with our schools and for a possible PW post.” Well, the replies poured in, and there are so many great anecdotes and tips for schools that I could not deprive ShelfTalker readers. The responses fell into a few major categories: preparation, creativity, and thoughtful attention to the small details. James Preller: My go-to line is that authors don’t do school visits, schools do author visits. An important distinction. It is the small details that matter most. I am always happiest when students and teachers have spent time with the books. Like everything else in life, the more they put into it, the more they get out of it. Jan Carr: In one school, the class had read all my picture books, and had discussions before I arrived about what the commonalities of the various books were, though on the surface the books were very different. The keen-eyed kids had noticed threads that ran through – in language, characters, structure, themes, etc. So when I arrived and we talked about process, they were VERY tuned in and got so much more out of it. I agree with James Preller, that schools get out of it what they put in in preparation beforehand. Familiarity with the books is key. Deborah Underwood: One school stands out because it was supremely organized, and clearly Author Day was a big deal to everyone there. There was a school-wide poster contest, and they even decorated the teachers’ lunch room for our lunch – tons of stuffed animals everywhere because of the animal nonfiction I’d written. After lunch, I was escorted to the library to sign, and class by class, the kids who had purchased books were escorted to the library. Each kid got a cookie, and there were chairs set up for them to sit in while they waited. So there was no signing chaos, and I got a chance to talk with each kid individually. 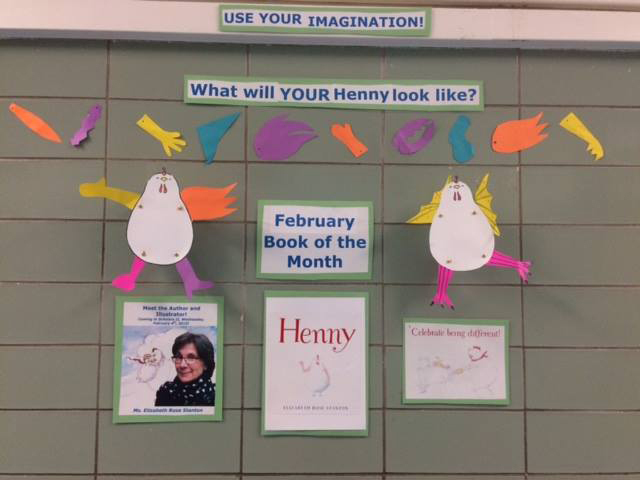 Elizabeth Rose Stanton: The East Harlem Scholars Academy in NYC made Henny their book of the month. My photo and little Hennys they’d made were lining the hall walls. The kids and their teachers made me feel like a rockstar! After my visit, I received a hand written thank you note from each child (almost 200)! Brian Lies: One school used paper bat cutouts as chits for their reading incentive program (one bat per book read), and they’d filled a hallway with many thousands of paper bats by the time of my visit. Another school held an essay contest in which students wrote about why they should have lunch with the author, and the winners read their essays to me at the table. One girl wrote about difficulties in her young life, her big dreams for herself, and why this lunch would help her succeed. Very touching! Jo Knowles: This is going to sound pretty simple but honestly my most memorable visits have been from schools in which the kids had read my books ahead of time and prepared really thoughtful questions to ask so that we had deeply meaningful discussions not just about my books but about life and school and social issues and so much more. The school that had a make-your-own sundae to celebrate See You At Harry’s was pretty great, too. Ruth McNally Barshaw: One of my favorite schools had each classroom do a different activity related to my books. Some classes wrote poems, some wrote stories, some illustrated, some made some of the origami/crafts in my books, and in some classrooms each student created an illustrated journal in the style of my books. They filled the walls of the gym with them in an enormous, stunning display. During breaks between presentations I could peruse the walls and see concrete evidence of my books’ inspiration on the children. Kyra Teis: OK, I’m coming at it from the other side, too. Not only do I visit schools as an author/illustrator, but also I’m the author visit coordinator for my girls’ elementary school. It’s all about prep and building excitement, By the time the visit day comes around, the kids feel like the author is a rock star. So, books are read by teachers in classrooms. Daily facts about the author or his/her books are broadcast on the morning announcements for two weeks ahead of time. 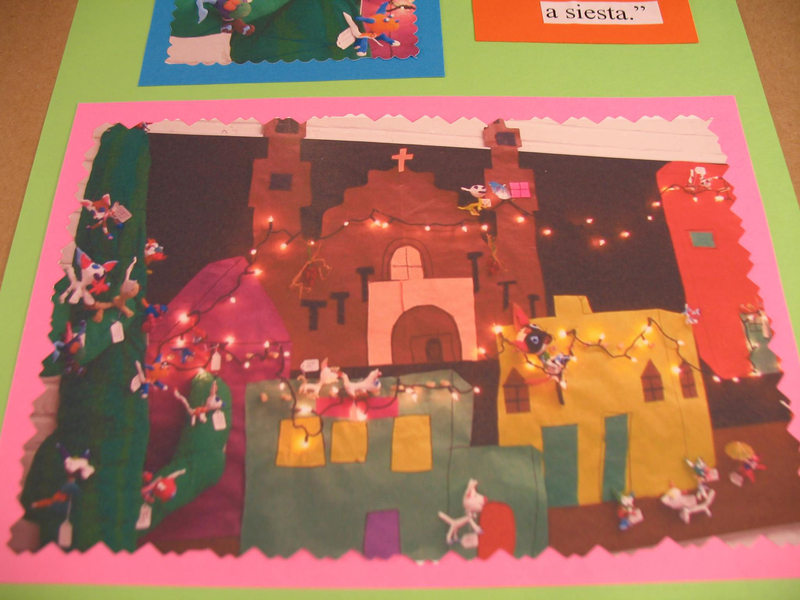 A committee of kids (usually from the on-site after school program) designs a bulletin board in the front hallway. I always have a message board where kids can write to the author on the bulletin board. I invite all the kids in the school to write/draw/cartoon a page for the author which we put together in a packet and give to him/her. I give free books to the two or three most creative entries. I usually have some kind of raffle with author trivia before the visit, also with a book as a prize. When we had Nick Bruel, the after school kids and I painted Bad Kittys and hung them all over the school with a prize for the person who found them all. I work with the same kids to paint a “red carpet” which they roll out when the author comes in. It is painted with themes from the author’s books: paw prints and paint a platters for Nick, handprints for Coleen Paratore, detective stuff for James Preller, etc. As you can tell, we have a lot of fun! And we always do lunch with the author – usually for the group of kids who helped me with the bulletin board and red carpet, but sometimes, the teachers choose. Christine Taylor-Butler: A school in Tulsa, OK. Primarily free and reduced lunch. I allowed each class to choose a different book for me to talk about. A grant paid for classroom sets. Literally turned their coat closets and classrooms into the universe, Tuskegee institute, a rainforest…. Teachers said it was a joy to not have to teach to the state exam. A school in Harrisonville, MO did chalk art of my books and themes all over the sidewalk leading up to the building. So many stories – so many favorites! David Lubar: Papered the building. Designed board games based on my books. Turned a book into interpretive dance. Greeted me with an orchestra. (At a school in the Bronx, every student takes an instrument.) Given every student a book. One librarian wore a ketchup-bottle costume (on the theory that I often encounter hot dogs, so this would be different). I’ve had so many great experiences, this is just off the top of my head. Don Tate: One librarian in East Texas had her students conduct a penny drive, where kids brought in their spare change on one day. They raised enough money to pay for half my full-day visit, making a personal investment in the day. That really rocked for the students and me. Special parking spaces, name in marquee, so many special moments. Daniel J. Mahoney: I’ve had an entire wall covered in life-size construction paper copies of my book characters. And they were excellent renditions!! Pat Lowery Collins: The teacher had read my book Tomorrow, Up and Away to the students without showing them the illustrations. The kids did their own drawings for the book, and these were lining the hallway when I arrived at the school. They were amazing. Lisa Yee: The students from one school acted out scenes from my book, and the teachers and librarian cooked the dishes that were in the story and served them during an author lunch. 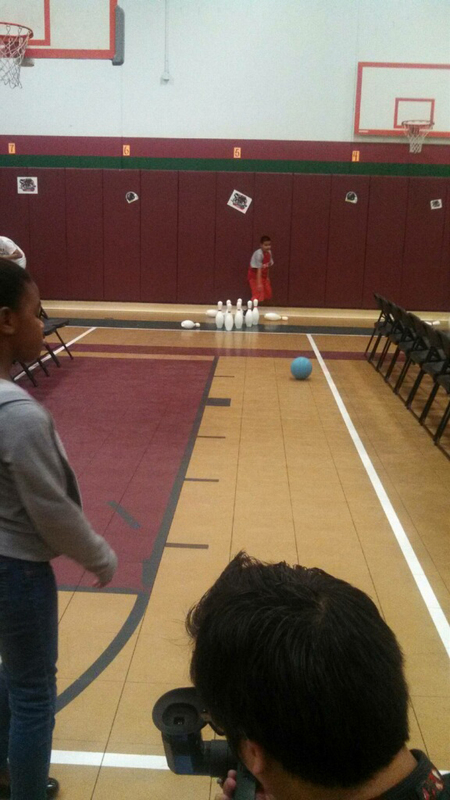 Crystal Allen: For literacy night at a middle school, the students and faculty turned their gym into a bowling alley, and made bowling pin shaped cookies to show their love for How Lamar’s Bad Prank Won a Bubba-Sized Trophy! Another school actually made a hardcover book out of my visit with pictures and actual dialogue from the students during the visit! Cynthia Lord: I’ve had lots of amazing experiences. I’ve done school visits on islands where getting there was an adventure: Nantucket, MA, I flew off the island in a tiny plane in a storm. On Frenchboro, Long Island, ME, I traveled on the mailboat with the local minister. At Biddeford Intermediate School (ME), the entire school came outside and lined the entry way so I walked into the school with kids cheering on both sides of the walkway. I felt like the queen! A couple weeks ago in Hanson, MA, the fifth graders presented the third graders with t-shirts that had a quote from Rules on the back (they do this every year for their “One Book” title). I’ve had schools do plays, a ballet, write songs, make movies, and lots of artwork around my books. I even had a wonderful book launch for my latest novel where a quarter of the town came out for it. I’ve also had schools that raised money for various topics in my books (autism, foster care). One Alabama school partnered with a school for children with autism and created an Easter Egg hunt for that school. They partnered, student-to-student, and did the hunt together. Another school in East Hampton, NY, “adopted” a school for special needs students in Haiti and raised money to buy them sports equipment (soccer balls, playground equipment, etc) after the earthquake. At the assembly, they Skyped with the head of the school who accepted the gift right then. I was choked up and had to push that feeling down just to be able to do the rest of the assembly. It’s those moments where a book you wrote is the first drop of water that creates those incredible ripples outward into the world that really move me the most. Another school did an entire musical production, featuring teachers signing hilarious song parodies, each dressed as a different animal on the sled. My favorite was the white-jumpsuited “Elvis” as the polar bear. The kids went nuts. 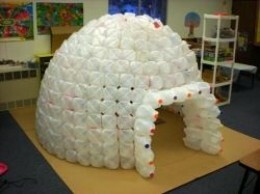 Alison Ashley Formento: One school created amazing paper mache bee hive banks in honor of my bee book and students collected “honey money” in these banks a few weeks prior to my visit to donate to a honeybee conservancy organization. Teachers counted the money the day of my visit and the students had raised nearly $1000 to help bees. Miranda Paul: A school near Albany, NY, made a song about my book and performed it for me, the illustrator, and the real woman that the book was about! Another school looked up the “about me” page on my website and changed the lunch menu to include my favorites, and though it’s not a school, the Sheboygan Children’s Book Festival organizes author visits and prints collectible author trading cards which is pretty awesome! Judith Byron Schachner: The most amazing experience for me came from a school in Alamosa, Colorado – in the heart of the San Luis Valley – where the vast majority of students were the children of migrant workers. The art teacher, Sue Patterson, had her student artists recreate scenes from the Skippy books so that when I walked into the school, it was as if I were stepping into the world of Skippy. Included in these *sets* were extraordinary clay and wire sculptures, based on the characters from my books. There were hundreds of them displayed all over the school in bright colors reminiscent of the carved wooden figures from Mexico. Some of these beauties were given to me as gifts. The welcome I received from Principal Señora Rodriguez, Sue Patterson the extraordinary art teacher, and the students of Boyd Elementary school will always burn bright in my heart. Amy Guglielmo One school created an art show inspired by the artwork in the Touch the Art books. Very special. Laurie Faria Stolarz I agree – art inspired by your work, mixed with quotes from your work to cover the walls. Letters to the author are also really nice. Then there’s nothing like a welcome sign and posters to remind students about the upcoming visit. I also once had a school librarian look at my list of favorite things (including my favorite snack, which is popcorn with soy butter and salt). She had it available to everyone at my chat. Kathi Baron: One middle school ordered in lunch for me and their writing club. We sat around a table & talked writing. I answered their questions & they told me about their writing projects. It was inspiring! Wendie C. Old: One school chose two boys to be Orville and Wilbur Wright. They came out on stage, one pushing a bicycle, and did a short enactment/ discussion of what they (the Wright brothers) were working on. Then they introduced me and off I went giving my presentation. They did this for each session I presented. Afterwards, the person in charge of the event took our picture together – which I still treasure. Margarita Engle: If I’m out of town, a ride from the hotel is a precious gift, saving me the anxiety of finding my own way around. It makes an enormous difference. Ellen Wittlinger: I’m sure others will mention the Rochester Teen Book Festival, too. I haven’t been for awhile, but the year I was invited it was amazing. Not only did the organizers treat us wonderfully, but we were all picked up at our hotel in the morning by two limos and when we got to the host school, the sidewalk outside was thronged with kids cheering and jumping up and down like we were rock stars. We were each assigned 2 teen handlers who escorted us through the day. The day was organized for maximum fun for both students and speakers. A plus. Gretchen Moran Laskas: It’s a small thing, but I’ve noticed that when the principal takes a moment to introduce him/herself and greet me, those visits are almost always more successful than when he/she doesn’t. An involved principal usually means teachers who are involved too – an enthusiasm that spills over to the students in hundreds of ways. A.S. King: There’s nothing like covering the walls of the school and library with quotes from my books – then giving some of them to students after my event so I can sign them for them. Simple, but really welcoming and lovely. Kristin O’Donnell Tubb: I love eating lunch with groups of kids who have read 2 or more of my books. I’ve seen that twice (both times in the same school system), and it made for excellent, small group interaction with dedicated readers over a longer time frame, and it doesn’t “disrupt” their school day. Ruth McNally Barshaw: Often schools greet me with homemade banners or decorated classroom doors or gift bags with protein bars, tea, and a school mug. Sometimes I’m assigned student ambassadors who assist me before the presentations. And some very thoughtful schools make arrangements for me to get out of the parking lot before the 3pm rush. This entry was posted in Uncategorized on September 29, 2015 by Elizabeth Bluemle.